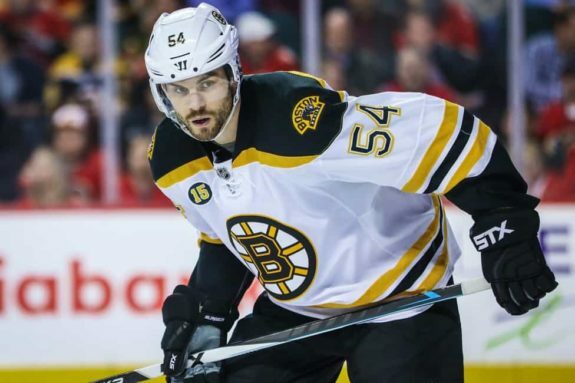 The rebuilding New York Rangers made a smart acquisition prior to the start of training camp as they acquired physical defenseman Adam McQuaid from the Boston Bruins. Their lineup will benefit greatly, as McQuaid offers experience, leadership and physical play in front of the crease. The Rangers’ lone gamble in the move is keeping him healthy. If this can be accomplished, then a playoff contender might be inclined to trade a high draft choice for McQuaid at the deadline. Emotions were high inside the Bruins locker room after the team officially announced the trade with the Rangers for journeyman defenseman Steven Kampfer and two draft choices. The reality of his situation with the Bruins was that McQuaid had become a healthy scratch because he was forced out of the lineup by younger, more talented defensemen like Charlie McAvoy and Brandon Carlo. The trade offers the Bruins $2.75 million in salary cap space for the coming season. McQuaid was the consummate teammate and a fierce competitor that never backed down from a challenge on the ice. Too often, he stopped the opposing team’s momentum either by blocking a shot in front of the net or dropping the gloves with their enforcer who became too physical with a teammate. It’s a great trade for the Blueshirts as they get tougher and gain a mentor for their inexperienced blueliners. McQuaid can teach by showing the type of preparation and sacrifices needed to become an NHL player. The youngsters can learn a valuable lesson that it doesn’t matter what your salary is because hockey still comes down to effort and winning one-on-one battles each night. If healthy, McQuaid can still be a reliable stay-at-home defenseman. He’s the perfect partner for a quicker, more offensive-minded defenseman, who can freelance and join the rush up ice on certain scoring chances. McQuaid has the sense to position himself in the neutral zone, but the question that remains if he has the required skating speed to slide back and cut off the angle on a sniper rushing towards the net. No one questions his tireless work ethic or commitment to team goals, especially after missing close to two months with a fractured right fibula last season. But McQuaid will be challenged this season by his age (he turns 32 in October) and the number of injuries sustained over the course of his NHL career (462 regular season games) from physical play. To earn a spot in the lineup, McQuaid must continue to make life miserable for power forwards who are camping out in front of the crease near Henrik Lundqvist. Toughness still has a home in today’s NHL despite the recent trend of having faster, younger and more skill-oriented players on the roster. To secure a playoff berth, you better have skaters who have the desired skill set, but also can drop gloves when necessary. Listen, we have to protect each other, we have to stand up for each other, we’ve got to support each other. We’ve got to do that from now until the day the season ends. Too often last season, the Rangers lacked the toughness required to compete with bigger, stronger teams like the Philadelphia Flyers and Bruins. 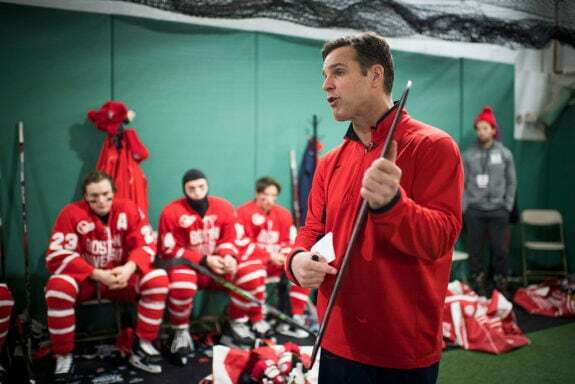 Rangers coach David Quinn told the New York Post that expects his players to protect one another when the action on the ice dictates physical play. McQuaid can set an example by showing his new teammates the fine line between being smart and aggressive, and taking a foolish penalty that leaves the team shorthanded. The loudest cheer to be heard inside Madison Square Garden this season could be after one of McQuaid’s signature bodychecks into the boards that catch everyone’s attention. It’s that type of blue-collar mentality that Ranger fans can identify with as McQuaid simply does his job without expecting many accolades. McQuaid’s role on each shift is keeping the puck out of the zone by any means possible. Given his current contract (one-year remaining, $2.75 million salary cap hit) situation, the odds are high that McQuaid will change addresses again before the conclusion of the 2018-19 season. The Rangers are hoping for multiple Stanley Cup contenders vying for his services, so a seller’s market occurs that gains them maximum value. Before leaving town, McQuaid could be one of the veterans that make a huge impact on the organization’s rebuild effort both on-and-off the ice. The influx of young talent in New York has given the Rangers a new identity and generated excitement among their fanbase that the organization is heading in the right direction with emerging stars. Determining the length of their development is the unknown factor of this formula, but having the right veterans on the roster like McQuaid could accelerate their growth and allow the Rangers to surprise the competition in the highly-competitive Metropolitan Division. McQuaid’s presence in the Bruins lineup will be missed, but his role in advancing the rebuild in New York could be significant.